Even if the 21st century wanted to intrude into Cambridge's Senate House Passage, there would be no room for it. Between the turreted exterior of Gonville and Caius College and the shining white Portland stone of the universitys Senate House, there is just about enough space for two bicycles to pass, rattling along the cobbles. The students clopping through in the early hours tend to take such surroundings for granted. They rarely crane their necks far enough to admire the rooftops. But if they had looked one night last month, they would have seen four faces, 50ft up, grinning at them. The young men (and it is almost always men) had arrived there by different routes, each a variation on what one described as a classic novice climb. Wearing dark clothes and without any special equipment, two of them wedged themselves in a niche and used the opposing walls to rapidly shimmy up. The other two hauled themselves up on a sunken drainpipe, moving rhythmically hand-over-hand and relying on grooves in the stonework when the pipe became shaky. In five minutes they were up and out of sight. Moments later they had reappeared, higher, on top of an adjacent building. Again, nobody had noticed. Had they done, though, they might have been puzzled that the climbing seemed more exacting and elegant than they would expect from drunken students on a foolish prank. That is because the climbers were not drunk and the climb was planned. They belonged to a society as old as any in the university, and they had been following the instructions in a book written by one of their alumni 70 years before. The "night climbers" have become well known in Cambridge --- and beyond. In the tales of the citys punt guides, as they take tourists for lazy trips along the river, the night climbers are an official club. Evading the proctors, they perform feats of derring-do. Padding around the roofs of their Brideshead Revisited world, they enact the sort of harmless gentlemanly practical jokes that capture the imagination of visiting Americans. And then they return to their colleges for a glass of sherry and a nod and a wink from the porters. "Another late night, Sir? Best not tell the dean." Ivo Stourton, the son of the Radio 4 presenter Ed Stourton, is about to publish a novel set in this alluring world. His book, The Night Climbers, is an old-fashioned love triangle played out amid the spires of Cambridges colleges. In its pages, a close-knit clique of climbers scales ever more treacherous routes across the roofs of the medieval buildings that dominate the city centre. 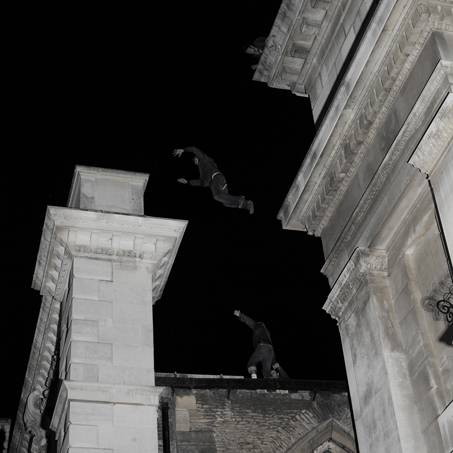 The truth about the night climbers is, paradoxically, more mundane and more fantastic. Long before the Frenchman Alain "Spiderman" Robert was dangling off the worlds skyscrapers, and before rock climbing was recognised as a sport, groups of Cambridge students were meeting after dark and performing increasingly technical climbs on the universitys buildings. Most were friends who had met by chance on buildings late at night or through legitimate climbing clubs. They were inducted by older students, or had headed out on their own after reading about it. Some would go on to pioneer mountaineering routes in the Alps and beyond. Among the first books on rock-climbing technique is a succession of early 20th-century guides to the university's buildings that provide detailed route descriptions still in use today. But these days, new arrivals at the university will find no stand at the freshers' fair, no e-mail list to join, no novice meets. To call it a club might be stretching a point, but neither are the night climbers just a few students with an irresponsible way of occupying themselves after the pubs have closed. They are more a continuum. Their identities, if they are known at all, are obscured in pseudonyms, but they have a lineage as long as any society in Cambridge. And the sport --- because a sport it is --- remains lively to this day. 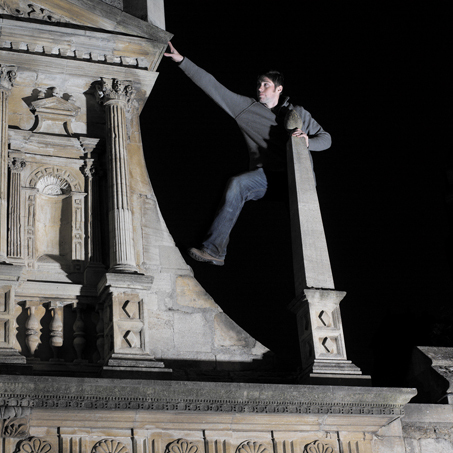 Dave Grimwade left Cambridge last year, and is now training to be a stuntman in Loughborough. He recalls the first time he went climbing. "It was the Fitzwilliam Museum, a lot of people start there. One of my friends, who later became my climbing sidekick, had read about it. We went up in daylight, with a little England flag to leave at the top, and people began to notice us. There was a big group gathered on the pavement. So we bottled out and climbed back down before they called the police." The police generally have an enlightened view of building climbing --- if nothing else, as long as no damage is caused, the law is far from clear that it is an offence. Most students they have caught have been returned to college authorities --- who are often far more severe, sometimes going as far as expulsion. The head porter of King's College seems to support that line. He initially denies knowledge of any climbing activities, before grumpily conceding that there was "an act of sheer vandalism" on the chapel a few years ago. Conversely, John Boulter, the chapel administrator, chuckles as he recalls the same event. "About four years ago, a lavatory seat was left hanging over a lightning conductor," he says. "The bursar wasnt very pleased about it, but I think most people take a fairly gentle view." Getting caught is the least of a climber's worries. Many of the colleges have routes that are little more testing than ladders, and it is here that novices often learn, but people inevitably graduate onto trickier climbs at more difficult colleges a bit like learning to climb in Scotland then moving on to the Alps. Except, of course, with building climbing there are no ropes or indeed equipment of any sort. However, though there have been injuries over the years more through luck than skill nobody has been killed. Andy Buckley is one of many night climbers who are also mountaineers. Graduating last year with a PhD in theoretical physics, he now splits his time between academia in Durham and climbing abroad. "Ive introduced quite a few people to building climbing," he explains. "Climbers are often up for it. If you like the stupidity of hanging off rock walls in the day, then theres a good chance you'll like the stupidity of hanging off buildings in the dark." Andy has digitised a copy of the original 1937 book The Night Climbers of Cambridge, hosting it on his website. The book describes climbs up most of the colleges and gives advice on how to keep safe: it has severe attitudes towards students who use ropes, and warns against climbing when drunk because "the climber may sober up at the crucial point and lose his Dutch courage". There are several proven methods for getting up buildings. One of the most common is to use what climbers call a chimney --- a place where two bits of wall oppose each other with a gap narrow enough to straddle. "Then you do an ungainly upward shuffle, one foot on the wall in front and one behind," claims Andy. "Of course you can also use the bits that stick out: drainpipes, stone flutings and gargoyles. In many ways it is a lot like normal climbing." "It is a wonderful sport," enthuses one climber. "There's nothing like being up on the roof and hearing the chimes of midnight. It brings a sense of purity." Andy is less poetic. "A large part of the attraction for me is just the sheer farcical idiocy of the whole thing." While night climbing is clearly dangerous, its proponents do not take it too seriously. Every so often, however, they indulge themselves in japes that dont always go according to plan. At one time there was a fad for leaving boxer shorts on lightning conductors. Someone would climb a spire, undress at the top and then leave them as a calling card. It was on the Fitzwilliam Museum that this hobby very nearly got Dave Williams, now studying for an engineering PhD in Sheffield, in serious trouble. A few years ago, by chance, almost 20 climbers ended up on the roof Dave among them. Various legitimate climbing clubs were holding meetings that night and must have all had the same idea. Before a renovation two years ago left the exterior crisscrossed with alarms, the Fitzwilliam was one of the best novice climbs in Cambridge. Less scary than Kings College chapel and more varied than Gonville and Caiuss Old Library, its non-college status left it largely free of night-time staff. There are many routes up its walls, but only one, a niche at the back, provides access to the large flat roof. A set of downward-pointing spikes halfway up the niche are meant to discourage climbers, but a judiciously placed lightning conductor has long helped students overcome this obstruction. So the group milled around on the top, swapping inflated stories of past exploits, while, below, two policemen walked on oblivious. It is surprising how much you can get away with on a roof. Nobody ever looks up. That is how they get away with it: one night climber tells of a time he dangled on a drainpipe for 10 minutes while just 6ft below college porters had a cigarette break. But of course, occasionally, people do glance at the tops of buildings. And in this case, one of the policemen did so just at the moment when Dave was leaving his boxer shorts on a spike. He called out and there was a mad scramble. Dave, delayed by pulling up his trousers, was the last down. Dropping to the ground, he was just in time to see the two officers come round the corner. So it was that he ended his night in a Benny Hill-style chase through Peterhouse colleges medieval gardens: over walls and under bushes. Climbers have been caught by the police before: this time Dave was lucky enough to escape. The shopkeepers of Market Square were the first to learn of the most famous climb in Cambridge history. Opening their stalls one day in 1965, they saw a banner strung between two of the spires of Kings College chapel that read "Peace in Vietnam". Of the four who put it there, one would become a Labour MP, another a professor of law. The other two would soon be dead. King's College had taken advice from the authors of the 1937 book on Cambridge climbing about how to prevent further attempts, and had blocked the approach. The students had to pick another route. The first section was the most perilous: 80ft of vertical climbing. The last section was the spires, where they unfurled the banner and climbed down, the operation undetected. "We had to maintain our anonymity. We had our degrees to think about," says Nick Raynsford (below), now MP for Greenwich and Woolwich. Edwin Gale, now a professor at Bristol, went with them on a climb a few weeks later. "We did the Bridge of Sighs and Trinity's Wren Library," he says. "Then we went up Clare College. I was so full of adrenaline I was careless." He fell, breaking his leg and forcing the others to get help --- effectively turning themselves in. "That was the beginning of the tragedies," says Raynsford, who was suspended for a year. Soon afterwards, one of the four, David Ainger, died climbing in the Dolomites. Another, Brian Rollin, was expelled after being caught on the roof of the Senate House. He died in a car crash a few months later. The final member, Mike McConville, now a law professor, had to restart his degree at another university. "We were concerned that others would follow our climb," Raynsford says. "We tried to make it clear how dangerous it was." They need not have worried; few have been brave --- or stupid --- enough to try. These photos are copyright Jan Stradtmann - contact him if you want to reprint or generally reuse them.